The Sign of the Cross is a simple religious act, which is so universal and so frequently practiced during the course of the day. We all make this holy sign, but hardly many of us give any thought to the mysteries it signifies. The sign of the Cross follows a believer everywhere. The sign of the Cross of Christ sanctifies all and everything, so when a believer makes this sign over himself it brings him closer to salvation. St. Cyril of Jerusalem says: "Let us not then be ashamed to confess the Crucified. Let the Cross be our seal made with boldness by our fingers on our brow and in everything; over the bread we eat, and the cups we drink; in our comings in, and goings out; before our sleep, when we lie down and when we awake; when we are on the way and when we are still. Great is that preservative; it is without price, for the poor's sake; without toil, for the sick, since its grace is from God. It is the Sign of the faithful, and the dread of evils; for He has triumphed over them in it, having made a mockery of them openly; for when they see the Cross, they are reminded of the Crucified; they are afraid of Him, Who has bruised the heads of the dragon. Despise not the Seal, because of the freeness of the Gift; but for this rather honor thy Benefactor". St. John Chrysostom wrote: "never leave home without making the sign of the cross". Tertullian recounts, "In all our travels in all our coming in and going out, in putting on our shoes, at the bath, at the table we mark our foreheads with the sign of the cross". This sign or mark on the forehead of consecration to Christ has an antecedent in Ezekiel's prophetic vision of judgment, in which the Lord commands that a "mark be set upon the foreheads" of the Israelites who cry out against the evil which surrounds them, so that by this mark God's people were identified as belonging to Him and saved from annihilation [Ezekiel: 9:4-6]. Other biblical references to "sealing" God's people with a sign on their heads are found in Revelation 7:4, 9:4. The origins of the sign are unknown; "our information is sparse because this ancient practice emerged naturally, as something that made sense to most Christians". The earliest descriptions, such as Tertullian's, indicate that the cross was made with one fingerâ€”probably the thumbâ€”on the forehead in the shape of a Hebrew T or a Greek X, letters that stood for names of God and Christ. Presumably, early Christians were taking their cues from passages in Genesis 4:15, Ezekiel 9:4, and Revelation 14:1 and 22:4 that describe a mark on the forehead as a sign of God's claim on a person. The similarities among the shapes of T, X, and the cross were noted by early writers, but it wasn't until the fourth century that the cross became a symbol of pride, of worship, and of Christian identity. By then, Augustine declared, "What else is the sign of Christ but the cross of Christ?" and advised that "the sign be applied â€¦ to the foreheads of believers". Crossing one's self recalls this seal, and the invocation that is said while making this holy sign calls on our God -- the Father, His Son, and the Holy Ghost -- and is a sign of our of belief; it is both a "mini-creed" that asserts our belief in the Trinitarian God, and a prayer that invokes the Holy Trinity. With the Sign, we send a visible sign to the world as St. Ephrem the Syrians says: "Mark all your actions with the sign of the life giving Cross. Do not go out from the door of your house till you have signed yourself with the Cross. Do not neglect that sign whether in eating or drinking or going to sleep, or in the home or going on a journey. There is no habit to be compared with it. Let it be a protecting wall round all your conduct, and teach it to your children that they may earnestly learn the custom". Because of what the Sign indicates -- the very Cross of our salvation -- Satan hates it, and our using it makes demons flee. The Sign of the Cross is made by holding the thumb, index finger, middle finger of the right hand together (signifying the Trinity) while tucking the ring finger and little finger (signifying the two natures of Christ) toward the palm. The sign of the Cross is made by touching the hand sequentially to the forehead, lower chest or navel area, and both shoulders, accompanied by the Trinitarian formula: at the forehead: In the name of the Father; at the stomach or heart: and of the Son; across the shoulders: and of the Holy Spirit; and finally: Amen. Today, Western Christians and the Oriental Orthodox touch the left shoulder before the right. Orthodox Christians use the right-to-left movement. There are several interpretations; according to Church Fathers the forehead symbolizes Heaven; the stomach, the earth; the shoulders, the place and sign of power. Also, the hand to the forehead may be seen as a prayer to the Father for wisdom; the hand to the stomach as a prayer to the Son who became incarnate; and the hand to the shoulders as a prayer to the Holy Spirit. The fingers put together first touch the forehead â€” to sanctify the mind, then â€” the belly near the solar plexus â€” for sanctification of feelings, then to the right and finally to the left shoulder â€” to sanctify one's bodily strength. The right cross, practiced by Eastern Orthodox believers, symbolizes how "Christ descended from the heavens to the earth, and from the Jews (right) He passed to the Gentiles (left)", according to Pope Innocent III. In Oriental Orthodox and Roman Catholic practice, the left cross has become standard, showing, (in one of many interpretations) that the believer hopes to be not on Christ's leftâ€”with the goats, as in Jesus' parableâ€”at the day of judgment, but on Christ's right. The difference between the Latin and the Greek customs is that the right side is associated with holiness, and the heart (on the left) with the spirit, so that those who, in mentioning the Holy Spirit, used the Latin phrase "Spiritus Sancti" (noun before adjective) touched left before right, while those who said, in Greek, "Ï„Î¿á¿¦ á¼‰Î³Î¯Î¿Ï… Î Î½ÎµÏÎ¼Î±Ï„Î¿Ï‚" â€“ tou agiou pneumatos â€“ (adjective before noun) did the opposite. Chrysostom admonishes: "You should not just trace the cross with your finger, but you should do it in faith". The sign of the cross is "a simple gesture and â€¦ a simple prayer". Very Rev. Canon Howe, "Sign of the Cross" in The Catechist, 1898. J.W. 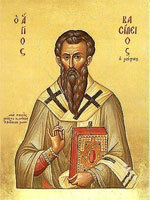 Drijvers, Cyril of Jerusalem: Bishop and City, (Brill, 2004). Rev. William Seymour, The Cross in Tradition, History, and Art, (Putnam Sons. Ltd., 1898). Also refer to Bert Ghezzi, The Sign of the Cross: Recovering the Power of the Ancient Prayer, (Loyola Press, 2006). Andreas Andreopoulos, The Sign of the Cross: The Gesture, the Mystery, the History, (Paraclete Press, 2006). Allan D. Fitzgerald, Augustine through the Ages: An Encyclopedia, (Eerdmens Publishing Press, 2009). Kees, den Biesen, Simple and Bold: Ephrem's Art of Symbolic Thought, (Gorgias Press, 2006). Bert Ghezzi, The Sign of the Cross: Recovering the Power of the Ancient Prayer, (Loyola Press, 2006). Rev. William Seymour, The Cross in Tradition, History, and Art, (Putnam Sons. Ltd., 1898).